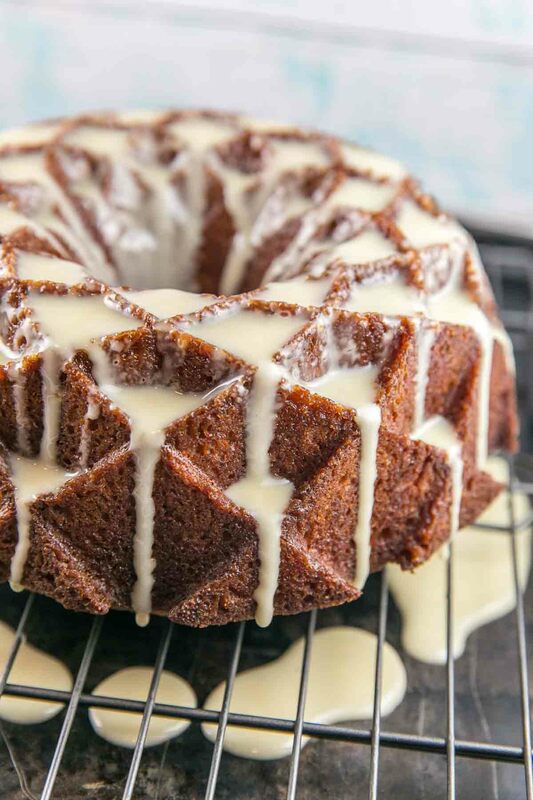 Orange lovers, this Orange Creamsicle Bundt Cake is for you! 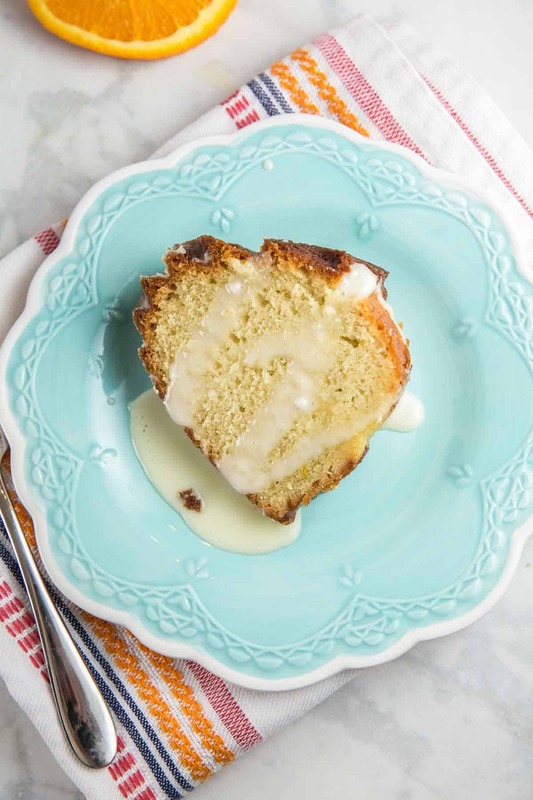 Orange and vanilla combine three different ways: in the batter, in a syrup which soaks into the cake, and a glaze poured on top. Mother’s Day is right around the corner. 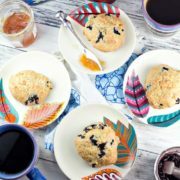 Brunch seems to be the standard Mother’s Day celebration — letting mothers everywhere sit back, put up their feet, and enjoy a beautiful meal as a way to thank them for all their tireless, hard work. 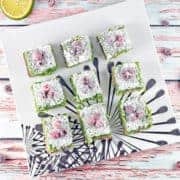 We all want our Mother’s Day brunches to be picture perfect, with delicious food, pretty glasses full of juice, a bouquet of fresh flowers on the table, and of course, a show-stopping dessert, right? Welllll.. we can all aim high, but sometimes things fall a little flat. Like, oh, say, Mother’s Day three years ago: my first as a mother. That time when my mother and my mother-in-law arrived at our house for brunch, to find our house full of smoke (from some spilled bacon grease), a hysterical wailing 3 week old (because… 3 weeks old and life is hard), and me still in my pajamas (from literally putting out fires). And this is why the show-stopping dessert is so vital. You may wind up answering the door in your pajamas with a screaming baby, but at least you’ll end the brunch with something picture perfect. Something like this orange creamsicle bundt cake. So since you’re already going to buy some juice, use it in the cake as well. 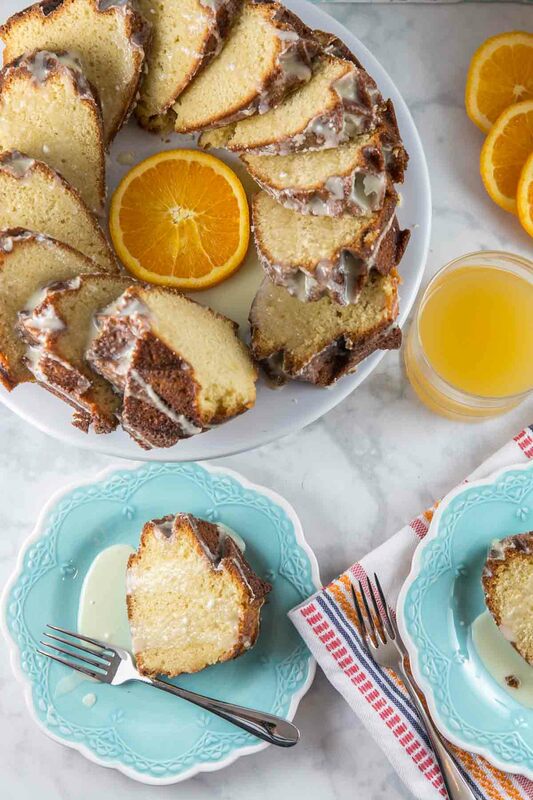 Orange and vanilla are perfect flavors for a spring brunch! I actually served this cake this past weekend at the baby naming ceremony for our new baby girl. I stopped at Whole Foods to pick up some other things (like some delicious smoked salmon for this amazing smoked salmon pasta salad – another Mother’s Day favorite around here, and the double batch I made disappeared at the baby naming lunch!) and picked up containers of Simply Orange Juice and Simply Peach Juice. Things I really love about city life: living in walking distance to Whole Foods. It’s so nice to be able to find top quality ingredients (like the smoked salmon, or a downright beautiful lamb shoulder we served for our Hanukkah dinner) right in the neighborhood. 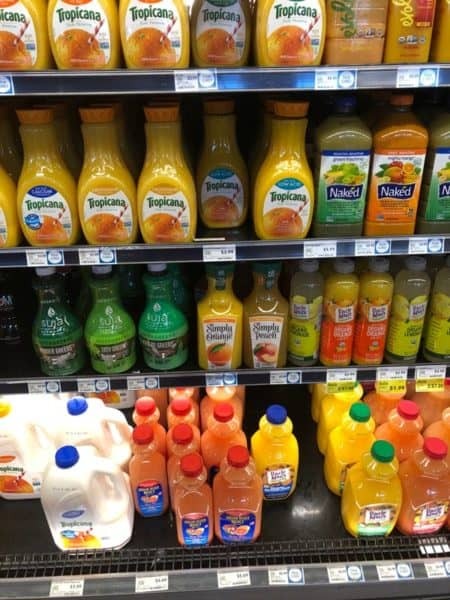 I love the Simply Juice family because they are 100% fruit juices, never sweetened or concentrated, and do not contain any preservatives, colors, or artificial flavors. It’s basically the next best thing to growing your own oranges and juicing them yourself, which is most definitely not an option in this climate. But Simply Orange has it down – they source fruit from around the world to ensure oranges are hand picked at their peak ripeness! 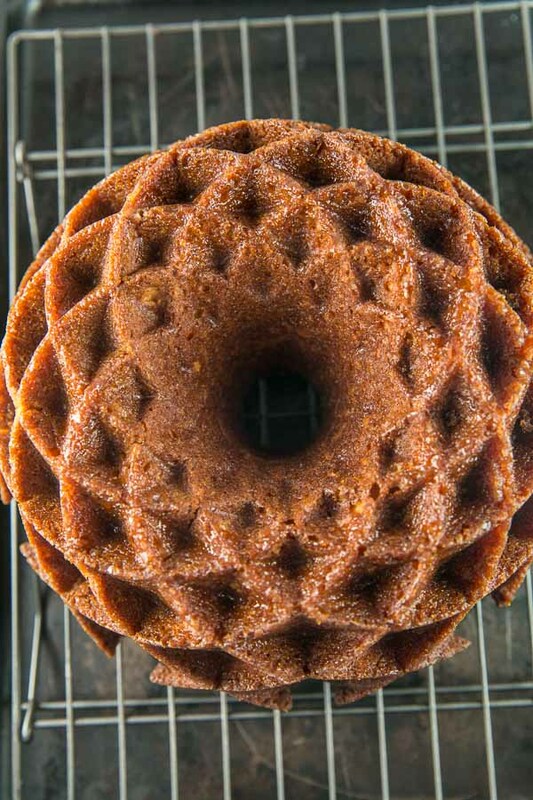 I’ve learned quite a lot of things about baking bundt cakes after my yearlong series on them, and one of the most important: too much moisture is not your friend. 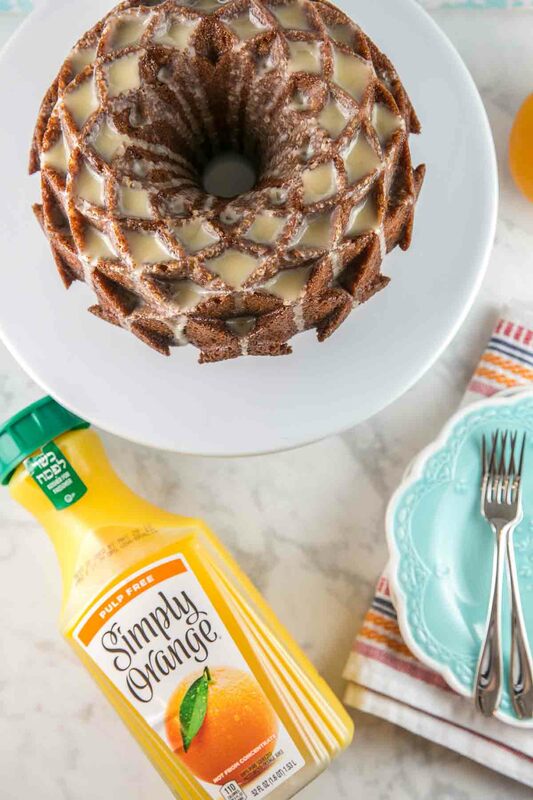 If a bundt cake has too much liquid, it will crumble and fall apart. 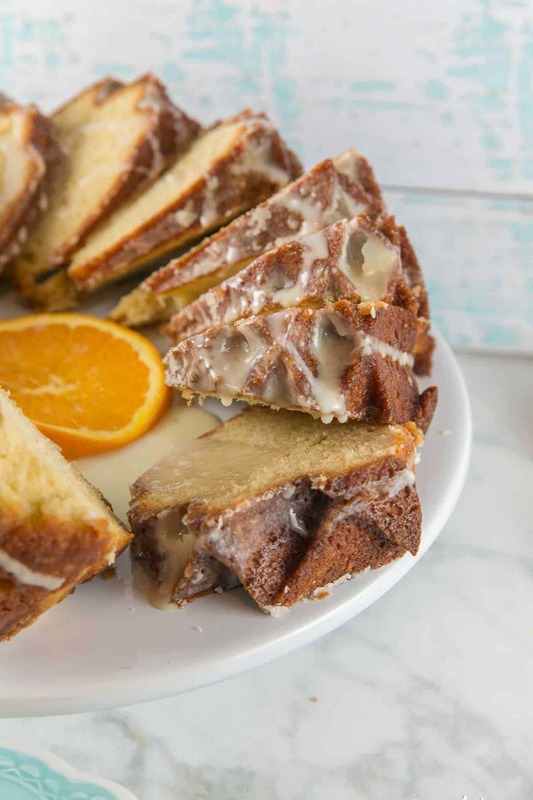 So in order to pack as much orange juice into this cake to get a true creamsicle flavor, we’re adding orange juice three ways. First up, in the cake batter itself, which imparts a nice, subtle orange flavor. Secondly, as a syrup, which we’ll pour all over the still-hot cake, which will absorb into the cake as it cools. And third, as as a glaze, which we will not only drizzle on top, but all over each slice, because this glaze is basically like drinking a liquid creamsicle… as in, it is amazing. Too amazing to merely use as a typical glaze on top, so we’re going to slice it and pour more on each slice. YES. 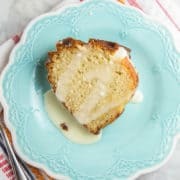 I chose to leave my cake with just the creamsicle glaze, but it would be equally delicious with a drizzle of chocolate or some sliced almonds on top – you really can’t go wrong. So for the rest of the weekend, the cake became known as the “OMG Creamsicle Cake.” Boom. Preheat the oven to 350 °F. Grease and flour bundt pan. Using an electric mixer, beat together the eggs, oil, milk, orange juice, and vanilla. Slowly add in the flour, sugar, baking powder, and salt. Continue to beat until ingredients are fully incorporated and smooth. 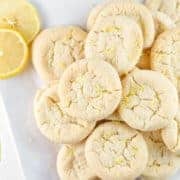 Bake 50 to 55 minutes, until a tester inserted into the cake comes out clean and the cake springs back gently when pressed with a finger. 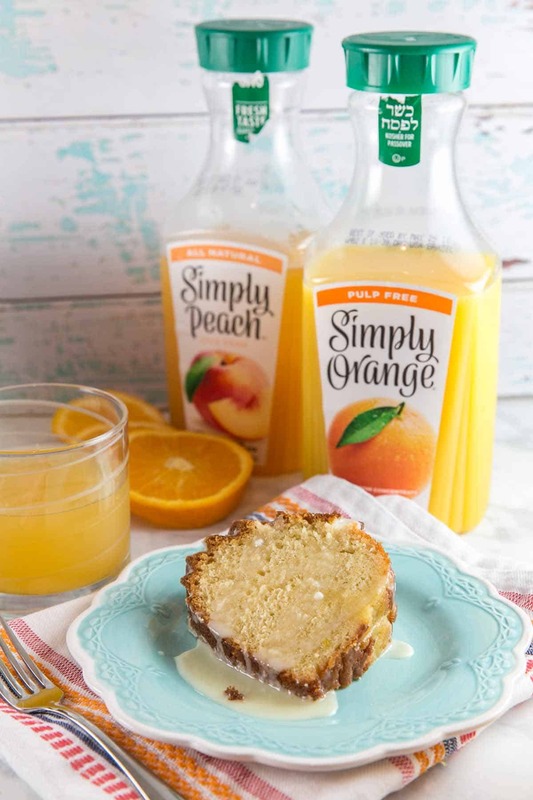 While cake bakes, whisk together the confectioners sugar and orange juice for the syrup. After removing cake from the oven, leave cake in pan and poke holes all over the cake with a long skewer. Pour the syrup over the cake and allow the cake to sit in the pan for 1 hour so the syrup absorbs. After an hour, invert onto a cooling rack and cool completely. To make the glaze, whisk together the confectioners sugar, orange juice, and vanilla until smooth. Pour 1/2 of the glaze over the cooled cake. Pour the remainder of the glaze over individual slices after cutting and serving. Cake can be made ahead and frozen. Wrap cooled, unglazed cake in plastic wrap, followed by a layer of aluminum foil and store in the freezer for up to 3 months. Bring cake to room temperature overnight, then cover with orange glaze. I have made this cake twice. It is awesome. Several people have commented this is the best cake ever. Where did u find such a Bundt Pan? I need to have one. Very beautiful!